Environmental stresses (soil compaction, drought, waterlogging) cause changes in plants’ root system structure, also affecting the growth of above-ground parts. The aim of this study was to estimate phenotypic variation among maize and triticale genotypes in root penetration ability through petrolatum-wax-layer (RPA). Also, the effect of shortage or excess of soil water on dry matter of shoots and roots and morphological changes in root system structure in sensitive and resistant maize and triticale genotypes grown in low or high soil compaction level was evaluated. To estimate RPA index, the petrolatum-wax-layer method (PWL) was used. The strength of three petrolatum-wax concentrations 60, 50 and 40 % was 0.52, 1.07 and 1.58 MPa, respectively. High coefficients of variation (CV) were observed in 0.52 and 1.07 MPa and for maize were 19.2 and 21.7 %, and for triticale, 12.5 and 18.3 %, respectively. The data indicate that the use of PWL technique is an effective screening method, and makes it possible to divide the genotypes into resistant and sensitive groups. The second part of this study investigated a multistress effect of soil compaction combined with drought or waterlogging on root and shoot growth and morphological changes in root system structure of maize and triticale genotypes differing in susceptibility to environmental stresses. Seedlings were grown for 4 weeks in root-boxes under conditions of low (LSC 1.1 g cm−3) or severe (SSC 1.6 g cm−3) soil compaction. Drought or waterlogging stresses were applied for 2 weeks from 14th to 28th day. In comparison to LSC treatment, in SSC treatment the decrease in dry matter of shoots and roots was greater for sensitive genotypes of maize and triticale (Ancora, CHD-147). Soil drought or waterlogging caused greater decrease of dry matter of shoots and roots in seedlings grown in SSC in comparison to LSC. The root penetration index (RPI) was estimated as a ratio of root dry matter in 15–40 cm root-box layer to total root dry matter. On the basis of RPI it was possible to group the genotypes according to their ability to distribute roots in soil profile. In comparison to LSC, SSC exerted a strong influence on the length of seminal and seminal adventitious roots, as well as the number and length of L- and S-type lateral roots developed on seminal and nodal roots. In both species the restriction effect of soil compaction on number and length of roots was more severe in sensitive (Ankora, CHD-147) than in resistant (Tina, CHD-247) genotypes. The restriction in roots propagation was greater in triticale than in maize. Exposure to drought or waterlogging in the case of genotypes grown in LSC and SSC treatments caused a decrease in number and length of particular components of root system structure. In both species the decrease of root number and length in plants grown under waterlogging was greater than under drought. The observed changes in root system were greater in sensitive (Ankora, CHD147) than in resistant (Tina, CHD-247) genotypes. Statistically significant correlations were found between RPA and RPI and also between these indexes and soil compaction, drought and waterlogging susceptibility indexes. This indicates that genotypes resistant to soil compaction were resistant to drought or waterlogging and also that genotypes resistant to drought were resistant to waterlogging. Abiotic stresses, e.g., soil compaction, drought and waterlogging are environmental factors that affect plants growth, development and yield. Different levels of soil compaction are caused mainly by natural processes and by the use of heavy machinery in soil cultivation. With drought, we deal in circumstances when the amount of rainfall do not compensate the water loss through a transpiration and evaporation, and with waterlogging, when the soil is inundated as a result of heavy rainfalls or river floods what causes drastic decrease in roots capability to water uptake as a result of decrease in oxygen content in water (Masle 2002; Fageria et al. 2006). The degree of plant restriction by environmental stresses mainly depends on the species, variety and the age of the plants. The tolerance of plant species to stresses factors is determined by plants genes and their expression underlies interactions with actual meteorological conditions of the environment. The inter- and intraspecific variations between species and within genotypes in responses to those stresses are significant, however, problems related to a combined influence of different soil moisture with physical soil parameters have not been studied thoroughly (Kono et al. 1987b; Masle 2002; Ashraf 2010). Plant physiologists and breeders search for the screening methods for selecting stress-resistant or sensitive genotypes (Hanson and Nelson 1985; Zagdanska 1992; Golbashy et al. 2010). A mathematical formulas for calculation of stress indexes can be found in studies by Fischer and Maurer (1978), Larsson and Górny (1988), Winter et al. (1988) and Golbashy et al. (2010). Screening tests are expected to be easy, fast and inexpensive and ought to correlate significantly with the stress indexes obtained in plants grown in field conditions (Hanson and Nelson 1985; Royo et al. 2000; Chaves et al. 2002; Clark et al. 2003; Witta et al. 2012; Grzesiak et al. 2013). According to Yu et al. (1995) the first application of petrolatum-wax layer to estimation of the root penetration ability was by Taylor and Gardner (1960) and in this study we applied this method as a reference for estimation of a phenotypic variation in root penetration ability of maize and triticale genotypes. Particular plants species develop morphologically different root systems. These morphological differences are usually closely connected with the physiological functions of the particular components of the root system. Root system structure may be characterized by the number, length, diameter of the particular root components, direction of extension of nodal roots and branching (rooting angle between plant axis and root) (Kono et al. 1987a, b; Yamauchi 1993; Grzesiak et al. 1999). The particular components of the plant root system show both similarities and differences in their functions. The lateral roots are responsible for the uptake of water and mineral components, while the main seminal and nodal roots are responsible for effective distribution of the laterals in the soil profile and water transport to green plant parts (Tardieu and Katerji 1991; Yamauchi 1993). According to Yamauchi (1993) cereal plants develop two types of the root systems, depending on the angle of growth of side branches—lateral roots and their distribution in a soil profile. “Concentrated” type of a root system develops a greater number of densely distributed nodal roots with relatively small rooting angle. Other type designated as a “scattered” develops fewer but longer nodal roots, many of which runs obliquely in the soil profile (larger rooting angle). Although it is reported that the responses of growth in each root type and architecture of root system to soil environmental stresses are different among plants with concentrated and scattered root system (Kono et al. 1987b; Yamauchi 1993; Iijima et al.1991; Chan and Weil 2010; Grzesiak et al. 1999, 2013). Typical responses of a plant root system structure to soil water content, temperature, soil compaction, pH is reduction in number, length of roots and restriction of downward penetration of the main root axes. Those changes accompanied by morphological changes in shoot include a decrease in plant height, leaf number, area and their thickness and changes in the shoot-to-root ratio dry mass and a decrease in grain yield (Clark et al. 2003; Fageria et al. 2006). Inhibited plant growth is mostly attributed to reduced rooting volume (Iijima and Kono 1991; Yamauchi 1993; Grzesiak et al. 1999, 2002; Masle 2002; Fageria et al. 2006). The physiological reasons associated with differential sensitivity of C3 and C4 plant species to environmental stresses (soil compaction different soil moisture) are not well-explained and understood (Nayyar and Gupta 2006, Grzesiak et al. 2012). 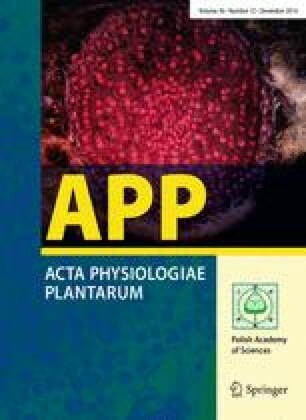 The aim of this study was to examine the response of maize and triticale genotypes grown in low and high soil compaction levels and limited or excess soil water content on the growth of shoots and roots, ability of root penetration in soil profile and morphological changes in root system structure. The responses of maize and triticale genotypes to drought and waterlogging may explain how these species manage their growth under soil compaction. Experiments were carried out on eight single-cross maize hybrids and on eight strains and cultivars of spring triticale. Maize grain was obtained from Pioneer Overseas GmbH (Austria), Pioneer Saaten (Poland), Garst Seed Company (USA), Agriculture Canada and SEMPOL Holding (Slovakia). Triticale grain was obtained from DANKO in Choryn and from IHAR, Małyszyn (Poland). List of maize and triticale genotypes is presented in Table 1. Two experiments were conducted: experiment no. 1 was designed to test root penetration ability index (RPA) for eight maize and eight triticale genotypes and experiment no. 2 was designed to determine of changes of root morphological traits in two maize (Ankora, Tina) and two triticale (CHD-147, CHD-247) genotypes differing in susceptibility to environment stresses, e.g., drought, waterlogging and soil compaction. Plants were grown in air-conditioned growth cabinets under the following day/night conditions: temperature 25/18 °C (±2.5 °C), relative humidity (RH) 70/60 % (±5 %) and during a 14 h photoperiod from 7:00 to 21:00 (artificial irradiance from high pressure sodium lamps, Philips SON-T AGRO, 400 W) PAR was equal to about 350 μmol m−2 s−1. In experiment no. 1 petrolatum and wax layer (about 0.2 cm) was used to create barrier for root growth, as described by Yu et al. (1995). Petrolatum (Paraffin pure–AppliChem, GmbH, Danmark) and wax (Vasline white–AppliChem, GmbH, Danmark) layer was varied by mixing melted of both substances in temperature about 80 °C in various proportions (v/v) 25:75, 35:65, and 40:60. The strength of three petrolatum and wax concentration in 24 °C were about 0.52, 1.07 and 1.58 MPa. Seedlings were grown in two-part container. In an upper part (8 cm high, 18 cm diameter) was placed a plastic grid (0.5 cm) to support petrolatum-wax layer and soil substrate (vermiculite). The bottom part of the container (13 cm high, 17.5 diameter) contained water solution of full strength Hoagland medium. Germinated grains were placed in the upper part about 1.5 cm over plastic grid with petrolatum-wax layer. As a control treatment the container without petrolatum-wax layer was used. After 14 days of growth number of penetrated roots was determined. For each maize or triticale genotypes (16), treatment (4), five containers with five plants were used. In experiment no. 2 seedlings of maize (Anova, Tina) and triticale (CHD147, CHD-247) were grown in root-boxes, what enabled the non-destructive isolation of all components of the root system (Kono et al. 1987a). The set of a “root-box and pin board method” consists of: a plexiglass root box (width, 0.25 m; depth, 0.40 m; thickness, 0.02 m), a pin board for sampling the root system, and a polyethylene sheet (envelope) for handling and preserving the root system. Root boxes were filled with a mixture of garden soil—loamy soil (85 %) and silt-sand loam (15 %), peat and sand (1:1:3—v:v:v). Air-dried soil substrate was sieved in a 0.25 cm mesh and mixed with a compound fertilizer (N, 28 mg; P, 18 mg; K, 14 mg) at the rate per 1 kg of the soil substrate. Two levels of soil compaction were applied: LSC (low) and SSC (severe) and for those treatments, the air-dried soil bulk densities throughout the 0–40 cm soil profile were set at 1.10 and 1.58 g cm−3. Mechanical impedance in soil substrate was measured with penetrometer DIK 5520 (Daiki Rika Kogyo Co. Ltd, Japan). Soil pore distribution was divided into five classes of pore diameter (>350, 100–350, 25–100, 10–25 and <10 μm). Total pore size, in percent of soil volume for treatments LSC, and SSC was 53.5 and 47.2 %, respectively. Soil substrate pH was about 7.1 and percent of organic material was 0.7. Field soil water capacity (FWC) for soil mixture was determined according to Kopecky methods. Air-drained soil samples (110.0 and 160.0 g) were placed inside metal cylinders, with the 1 mm hole at the bottom. For all samples, volume was 100 cm3. Cylinders with samples were placed inside the container with water for 30 min. After 8 h, maximal soil water content in samples was 0.47 and 0.39 (g cm−3), respectively, and after 48 h decreased to 0.25 and 0.18 (g cm−3), respectively. According to Hillel and van Bavel (1976) those last values were assumed to be 100 % of soil field water capacity (FWC). During the experiment the root-boxes were weighted every day, and the amount of the water loss through evapotranspiration was refilled to keep the constant mass of root-boxes in each treatment at a level of 65–70 % FWC. A single pre-germinated grain was planted at a depth of 3–4 cm. After 28 days of plants growth under LSC conditions in Zadoks scale was about 15 for maize and about 13 for triticale. On the 28th day of growth the seedling was cut into shoots and roots. The roots were sampled after the soil in the pot had been washed away by a gentle stream of water. Root samples were preserved in a FAA (formalin, acetic acid, and ethanol) solution. In experiment no. 2 for control conditions soil water content was maintained from sowing to 28th day at the level of 65–70 % FWC. For drought (D) or waterlogging (W) treatments from 14th to 28th day for D soil water content was kept at the level of 30–35 % FWC and for W soil water content was kept at the level of 100 % FWC. For measurement of the number and length of root components, a digital image root analyzer (Delta T Scan, Delta T Co., England) was used. Determination of the number and total length of L- and S-type roots was made only for seminal roots. The seminal roots were scanned and measurements were taken with application of light pen of electronic planimeter Microplan II (Laboratory computer Systems, Inc., Cambridge, Massachusetts). Classification of lateral roots into L-type or S-type was made according to root length. The L-type lateral root was long (>2.0 cm) and branching into the higher order lateral roots, while S-type was short (<2.0 cm) and non-branching. Dry matter of shoot (S) and roots (R) were sampled in experiment no. 2. and were determined on the 28th day after sowing, after drying at 65 °C for 72 h. Dry matter of roots was determined for separately three layers of soil substrate in root box (0.0–15.0, 15.0–30.0, and 30.0–40.0 cm). For each genotypes (4) and treatments (6) three root-boxes with one plants were used (n = 3). Values of root penetration ability index (RPA) were calculated in experiment no. 1 as a ratio of number of roots penetrate petrolatum-wax layer per seedling (n = 5). All data were analyzed by one-way ANOVA using Statistica 10.0 (StatSoft, Inc., USA). Linear correlation analyses were used to determine the relationship between soil compaction stress indexes (SCSI) and drought susceptibility index (DSI) or waterlogging stress indices (WSI). Our objective in experiment no. 1 was estimation of phenotypic variation in root penetration ability among maize and triticale genotypes. We used petrolatum-wax layer system that consists of different proportion of petrolatum to wax as screening method, according to Yu et al. (1995). The root penetration ability index (RPA) was measured as a ratio of the number of roots penetrating petrolatum-wax layer to the number of seedlings. The strength of three petrolatum-wax concentrations 60, 50 and 40 % were 0.52, 1.07 and 1.58 MPa, respectively. As a control (0.00 MPa) a container, only with plastic net but without petrolatum-wax layer, was used. The mean values of RPA index decreased for 0.00, 0.52, 1.07, and 1.58 MPa in maize by 18.1, 13.8, 11.2–3.7, respectively, and in triticale: 17.2, 12.4, 5.9–1.0, respectively (Table 1). High coefficients of variation (CV) were obtained for 0.52 and 1.07 MPa, in maize equaled 19.2 and 21.7 %, respectively, and for triticale 12.5 and 18.3 %, respectively. In both species correlation coefficient r, between RPA treatments were statistically significant except 1.58 with 0.52 and 1.07 MPa treatments. Analysis of variance ANOVA of RPA index is summarized in Table 2. For maize and triticale, treatment and genotype main effects were significant at 0.05 probability level, while genotype × treatment interaction was not significative for both species. In Table 3 and Fig. 1, linear correlation between RPA indexes and soil compaction, drought and waterlogging susceptibility indexes described in our earlier papers (Grzesiak et al. 2014 in press) are presented. Statistically significant negative linear correlation between RPA (0.52 and 1.07 MPa) and soil compaction susceptibility index SCSI (1.3 and 1.6 g cm−3) was found. On a basis of RPA it was shown, that the difference in root penetration ability occurred and that it is possible to divide the genotypes into resistant and sensitive group. For 0.52 and 1.07 MPa soil impedance, in case of both species, rankings of genotypes according to their susceptibility were close or similar. Following maize genotypes were included in a sensitive group: Ankora, Pioneer 39-G12, in a moderate sensitivity Garst R5515, Garst 8702, and in a resistant group Tina, Pioneer 3925, Garst 8344. For triticale to a group a sensitive CHD-12,CHD-147, genotypes were included in a sensitive group, moderate sensitive Mieszko, MAH, Migo and resistant CHD-220, CHD-247, Wanad. Mechanical impedance caused by compacted soil is a factor influencing root growth, elongation and proliferation (Tu and Tan 1991; Yu et al. 1995; Masle 2002). The ability of root to penetrate in soil profile can be beneficial in plants response to environmental stresses like soil compaction, drought or waterlogging; however, breeding for these traits is hindered by the lack of screening tests. In our experiment the petrolatum-wax layer consisted 40 and 50 % petrolatum and 60 and 50 % wax with the penetration resistance strength of 0.52 and 1.07 MPa was satisfactory for estimation RPA index among maize and triticale genotypes. Root penetration ability varied both between and within crop species (Assaeed et al. 1990; Materechera et al. 1992; Kasperbauer and Busscher 1991; Masle 1992). Busscher et al. (1986) and Atwell (1993) suggested that soil strength about 1 MPa affected root growth more than 2 MPa: restricted root growth and reduced root length and root elongation. Glinski and Lipiec (1990) summarized the range of penetration ability for 14 plant species ranged from 0.3 MPa for rice to 8.0 MPa for ryegrass. Yu et al. (1995) used wax-petrolatum layer (1.4 MPa) to evaluate genetic variation in rice and found that roots of genotypes from drylands had greater ability to penetrate than wetland habitat and root penetrate ability was positively correlated with root thickness. Also differences in root penetration ability were found in dryland and wetland rice cultivars characterized as a semiaquatic species adapted to ecosystems ranging from flooding to dryland (O`Toole and Cruz 1983). O`Toole and Cruz (1983) and Chang et al. (1986) suggested that leaf epicuticular wax and root thickness play role in root characteristic for drought stress tolerance and in root penetration ability. Cultivars from dryland tended to have thicker roots than cultivars from wetland habitats. According to Yoshida and Hasegawa (1982) traditional drought-resistant dryland rice cultivars have thick roots and that thicker roots have been associated with deep root systems. Four weeks of growth under conditions of severe (SSC) soil compaction, in comparison to treatment with low soil compaction (LSC), decreased dry matter (DM) of a shoot (S), roots (R), total seedling dry matter (S+R) and shoot to root ratio (S/R) (Table 4) resulted in stress sensitive genotypes (Ancora, CHD-147) and resistant (Tina, CHD-247). After growth by 28 days in the SSC treatment the decrease of growth parameters were greater for triticale than for maize. In this treatment shoot (S) dry matter decreased by about 23 and 13 % in triticale genotypes CHD-147 and CHD-247, respectively, and by 8 and 7 % in maize genotypes Ankora and Tina, respectively. The decrease in root (R) dry matter for triticale genotypes CHD-147 and CHD-247 was 18 and 7 %, respectively, and for maize genotypes Ankora and Tina was about 6 and 5 %, respectively. For triticale stress sensitive genotype (CHD-147) the decrease of S/R ratio was statistically significant and for both maize genotypes and for triticale stress-resistant genotype the decrease of S/R ratio were also observed, but differences were not significant. Soil drought (D) or waterlogging (W) from 14th till 28th day of seedlings growth caused greater decrease of dry matter of shoot (S), roots (R), and S+R in seedlings grown in SSC than LSC. In seedlings grown in severe soil compaction and in waterlogging (SSC+W) the decrease in dry matter of S, R and S+R was greater than in treatment SSC+D especially for sensitive maize hybrid Ankora. However, in triticale differences in decrease of dry matter between sensitive (CHD 147) and resistant genotypes CHD 247 were smaller. The data of root penetration index (RPI) was examined using ANOVA analysis of variance and is shown in Table 5. For both species there were significant differences among genotypes (GE) and treatments (TR) and only for maize for soil compaction (SC) and interactions GE × TR were also significant. Obtained results indicate the existence of genetic variation of stress susceptibility between genotypes of maize and triticale and possibility of selection of genotypes in penetration of roots in soil profile. Results obtained in this work confirm that severe levels of soil compaction led to reduction in shoot and root growth. Several authors have pointed out effects of soil impedance on reduction of plant dry matter, size, and yield (Andrade et al. 1993; Lipiec et al. 1993; Whalley and Dexter 1994). Reduction in dry matter of maize shoots in compact soil conditions was mostly due to reduction in leaf area, stem diameter and plant height (Lipiec et al. 1996) (Tables 6, 7). In comparison to low level of soil compaction (LSC) severe level (SSC) influenced the length of seminal and seminal adventitious roots, the number and length of L- and S-type lateral roots developed on seminal roots and nodal roots (Table 8; Fig. 2). In both species restriction effects of soil compactions on number and length of roots was severer in sensitive (Ankora, CHD-147) than in resistant (Tina, CHD-247) genotypes. In SSC, length of the seminal root decreased by 14.0 and 8 % in maize (Ankora, Tina) and 19 and 15 % in triticale (CHD-147, CHD-247), respectively. The total length of seminal adventitious roots decreased in maize genotypes Ankora by about 15 % and in Tina 11 % in triticale CHD-147 and about 20 %, and in CHD-247 about 24 %, respectively. Higher decrease of total number and length of nodal roots was observed in treatments SSC in comparison to treatment LSC. In Ankora, decrease in number and length were about 11 %, and in Tina about 10 %. In triticale decrease in number of nodal roots in CHD-147 and CHD-247 genotypes were 16 and 15 %, respectively, and in length 16 and 11 %, respectively. Soil compaction also reduced the number of both L- and S-type of lateral roots developed on seminal root. The number was more severely restricted in S-type lateral roots than in L-type roots regardless of species. The restriction in lateral root propagation was greater in triticale. Induced of drought (D) or waterlogging (W) for genotypes grown in LSC and SSC treatments caused higher decrease of number and length of particular components of root system structure. In both species decrease of root number and length in plants grown under waterlogging (W) was higher than plants grown under drought (D). Moreover, decrease in number and length of particular components of roots system was greater in genotypes for which values of RPA and RPI indexes were lower (Ankora, CHD147) comparing to genotypes with higher values of these indexes (Tina, CHD-247). Iijima and Kono (1991) examined the effect of soil compaction on a root growth as discriminating root components in rice and maize. In their research, responses of root types and root system to soil compaction were clearly different between rice with “concentrated” type of root system and maize with the “scattered” type. Along with the present study, a consistent trend has been found that a species with “concentrated” type of root system showed less restriction of roots growth due to high soil compaction compared to “scattered” type, as shown in a comparison between triticale and maize. The heavy suppression of lateral root growth would affect plant nutrition and water relation because the soil compaction resulted in decreased size of root system, increased irregularity of root distribution and thus in greater distances for the transport of water and nutrients to the nearest roots (Tardieu 1991; Lipiec et al. 1996). Also the restriction in number and length of each root type in conditions of high soil impedance accompanied by a decrease in leaf water potential, decrease in photosynthesis, and changes in stomata conductance and contents of internal carbon dioxide (Grzesiak et al. 1999). Highlighting the water relation and gas exchange rate of plants under soil stresses, many studies indicate that leaf water status and gas exchange parameters (especially stomata behavior) are influenced through several mechanisms (Lipiec et al. 1996). According to Masle (2002) root-borne signals affect the rate of development in the apical meristem, cell division and cell expansion in the expanding leaves and they induce stomatal behavior. In cereal species exists interspecific differences in growth responses to environmental stresses. In this study, we discussed various viewpoints on changes in root system structure of maize and triticale genotypes seedlings. Both, soil compaction and periodical soil drought or waterlogging caused, in both species, a decrease of shoot and roots dry matter and changes in roots distribution in the soil profile. Changes of growth traits were higher in genotypes with high stress susceptibility indexes and low ability to soil root penetration. Future study are required to study the characteristic of physiological processes, anatomical and morphological changes in particular components of root system, roots distribution and roots extension rate in plants grown in the conditions soil stress. MTG, AO, GR, SG and TH designed the research; MTG, AO, GR, KH and FJ conducted the research; MTG, AO, GR, AR, SG, FJ and TH analyzed the data; MTG, AO, GR, FJ, SG and KH wrote the paper; MTG had primary responsibility for the final content. All authors have read and approved the final manuscript. The authors are grateful to the National Science Centre (NCN) for financial support (Project No. N N310 782540). Also the authors express gratitude to the “Pioneer” Overseas GMBH, Vienna, (Austria), the Garst Seed Company, Iowa (USA), the Agriculture Canada, Agassiz Research Station, (Canada), SEMPOL Holding, Trnava, (Slovakia), DANKO, Choryn and IHAR, Małyszyn (Poland) for the grain of maize and triticale genotypes used in experiments.